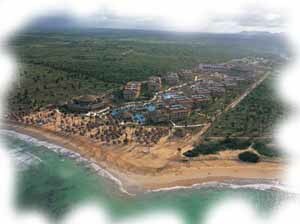 The first thing you’ll notice about Sunscape Beach Punta Cana is that the property extends away from the ocean. While the grounds are beautiful, there can be some quite lengthy walks from your room to the beach. Depending on where you like to be – buildings 1 & 2 are closest to the beach and 4 & 5 are the furthest away. Make sure you request a building and ocean or mountain view upon booking. Following this up with an e-mail to the hotel is a good idea. 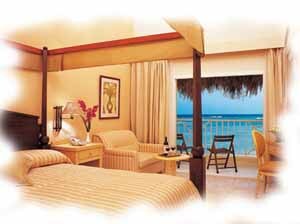 The rooms at Sunscape Beach Punta Cana are quite small, but immaculate and have very comfortable furniture. Most rooms have four-poster beds (one king size or two doubles) instead of the usual mattress on a cement slab. Other conveniences in the rooms include: wall safe at no charge; minibar (restocked daily); 24 hour room service menu; satellite TV; hairdryer; alarm clock; dry-cleaning and laundry service is even available for a reasonable price. The resort has one buffet restaurant and six “themed” a la carte options (Japanese, Mexican, Local seafood, steaks, Italian)– none of which require a reservation. The idea of not having to wait in line just to find out that the next available dinner reservation is the day after you leave is very comforting. However, when the resort is full guests can sometimes have lengthy waits to get a table – not really a bad thing (have a drink while you wait). You will find that the food at this resort is really quite good, compares to almost any other resort we’ve been to – the Japanese restaurant is our favorite. Do note that dress for supper at most restaurants is what they call “casual elegance” – guys need pants! The pool is probably the most striking feature of Suncape Beach Punta Cana – it extends from the lobby all the way to the beach and has Jacuzzis off of it, waterfalls in it. The separate kids’ pool keeps a lot of the splashing away and there is an ample supply of pool floats for relaxing. Perhaps the nicest pool in Punta Cana! Sunscape Beach is no different than anywhere else when it comes to beach chairs and palapas. There are 620 rooms, they can’t put up 1000 palapas, a resort simply can’t supply enough of them for everyone. Unfortunately it’s a resort reality – get out of bed early, play the game and go put your towel over a chair to reserve it. Sunscape Beach Punta Cana also has a very good kids’ program (the Explorer’s Club) for children of ages 3-12. Activities are fully supervised and pagers given out to parents – a comforting touch. There is also a kids sleepover available one night a week in tents on the beach – haven’t tried this one, but have heard good things about it (kids tend to come back exhausted the next day though). Only drawbacks to the Sunscape Beach Punta Cana resort are: that the beach is not the most manicured in Punta Cana and waves can be quite rough in Playa Uvero Alto; there are quite long walks to the beach; many of the available excursions are quite far away from this hotel (although deep-sea fishing is quite close). Bring water shoes as there are hunks of coral in the water. English of staff is quite good, they appreciate being spoken to in Spanish – learn some Spanish phrases. There is not much of a nightlife here, so don’t go to Sunscape Beach expecting to party! Interested in Sunscape Weddings ? Try Victoria S's All-Inclusive-Weddings.com. I've sent several people to Nancy over the years and she's made their dream weddings a reality. For more reviews, maps and pricing check out our Sunscape Beach Punta Cana booking page. Victoria S has been the lead wedding planner for All Inclusive Resorts for years and has now started a new division specializing in Caribbean destination weddings. Book your rooms with them and they take care of your destination Caribbean wedding planning at no charge!